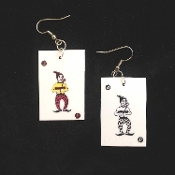 Funky JOKER PLAYING WILD CARDS EARRINGS - Lucky Jokers Wild Card Las Vegas Casino Luck Novelty Costume Jewelry - Poker Gin Rummy Canasta Euchre BlackJack Lucky Charm. Plastic coated paper charms approx. 1-inch (2.5cm) wide x 1.5-inch (3.75cm) long. Great gift for your favorite gambler or card shark!